Accusing the ruling party of conspiring to rig vote, BNP Chairperson Khaleda Zia on Monday urged people to come out in groups and vote spontaneously on December 30 to protect their rights to franchise. “We’ll be there in the election battle firmly. People’s united strength can foil any evil motive of the autocratic ruler,” she told reporters at a press conference at her Gulshan office, reports UNB. Referring to a Jatiya Party chief HM Ershad’s remark that the municipal election will be concluded by 9am on December 30 and a minister’s comment that BNP’s defeat has been confirmed before the polls, Khaleda said these statements also exposed the government’s plan to make the election a mockery. 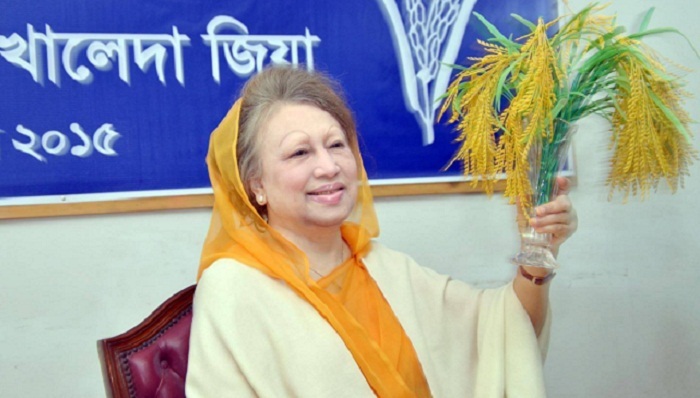 In her-30-miniute written speech at the press conference, Khaleda also depicted the country’s current situation and the government misdeeds, repressive acts and corruption’. She, however, did not take any question from journalists. Khaleda alleged ruling party men are constantly intimidating opposition activists, voters and probable agents not to go to polling stations. Apart from ruling party cadres, the BNP chief said, a group of law enforcers are being used in carrying out various misdeeds in the election areas. Khaleda also criticised the Commission for seeking the Prime Minister’s help for checking election code violation by the ruling party men and said through this the EC has exposed its inability and helplessness in holding a fair election. The former Prime Minister hailed the journalists for efficiently and presenting before the nation the ruling party’s terrorism, capturing of voting centres, vote rigging and other irregularities in the past elections. She called upon the media men to play a courageous role in the municipal polls in presenting the fact. BNP acting secretary general, standing committee members and senior leaders of the 20-party alliance were present at the crowded press conference.